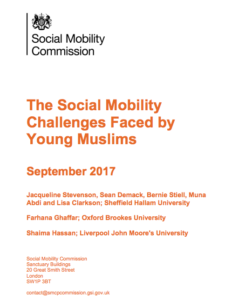 Following the release of the Social Mobility Commission’s recent report on young Muslims and their access to the labour market, I came in to meet the wonderful team at LKMco, share my opinions on the findings, and take part in a discussion about the research. The SMC’s work paints a stark picture: within the economically active population, only 1 in 5 of the Muslim population is in full-time employment, compared to more than 1 in 3 of the overall population. We covered a lot of ground during the hour-long discussion. What particularly stood out to me, though, was the influence that parental ‘aspirations’ can have on young people. The SMC talks at length about the responsibility employers and schools have in opening up opportunities for young Muslims. However, I believe there is also greater scope for schools and employers to work with Muslim families and broaden parents’ understanding of the opportunities available to their children. My parents, like those in many South Asian families (and, no doubt, other families too), had an ambitious but narrow understanding of what ‘success’ meant while I was growing up. They wanted me to pursue a ‘proper career’ in medicine, law, engineering or accountancy. I felt this most acutely when I told them I wanted to study Midwifery at university. For them, this meant their only daughter would work long, hard hours for relatively low pay, and they expressed wariness. In the end, I actually settled on History, which felt like a fair compromise; it was a subject about which I felt passionate, could help lead to an interesting career, but in their eyes didn’t have some of Midwifery’s ‘baggage’. My parents’ ambitions for me were clearly noble, but exemplify what I believe is a broader tension between parents’ priorities and aspirations for their children, and the more varied paths their sons and daughters might wish to pursue (particularly if – shock horror – they want to become a midwife or teacher, and not a doctor or lawyer!). However, before I go any further, it’s important to appreciate the role life experiences play in shaping aspirations. Many young people’s parents or grandparents came to Britain as economic or political migrants, seeking a better life for their families. Furthermore, upon arriving in the UK many migrants work long hours in risky and unsafe conditions for limited pay, which is often unreflective of their qualifications and training. Their priorities become paying rent, and providing food for their families. On top of this, many migrants face discrimination professionally and socially. All of this undoubtedly shapes the aspirations they hold for their children. Consequently, many first- and second-generation migrants hope their children will enjoy well-remunerated and high status careers that have the potential to ameliorate some of the challenges they themselves faced. Who wouldn’t want that for their child? However, I think a better balance could be struck, and one that would ultimately help young Muslims, Asians of any or no religious persuasion, and potentially all young people reach success in the workplace. This is not about parents compromising their high expectations and aspirations for their children; it is about broadening these aspirations to include a wider range of possible academic and career pathways. Ultimately young people should be free to pursue whatever path they feel is right for them, and it is the job of parents and educators to help them reach their potential. In light of the SMC’s report, I think there is greater scope to help Muslim families understand that there are many different meaningful and rewarding pathways out there, within and beyond medicine and law. Schools and employers both have a role to play here. Alongside the careers guidance and advice they offer their students, schools should invite families in to discuss possible academic and career options. If schools invite external speakers from different industries in to speak to pupils, they could ask parents in, too. Schools could also ask former students and other Muslim role models into the school to address pupils and parents. Employers could also do more to reach out to parents, which could be done in several ways. When reaching out to young people during school visits, they could also speak to parents as part of this (and so would need to work with schools to ensure parents are invited to the sessions). Furthermore, they could provide online content – literature and videos – specifically targeting young people’s parents, and perhaps featuring Muslim employees talking about why the career path is a rewarding one. This information could also discuss what the jobs involve, and the sorts of the qualifications young people will need. By reaching out to families and broadening the aspirations parents hold for their children, schools, universities and employers can help support a diverse, vibrant economy in which passionate young individuals excel in jobs they want, rather than jobs they feel they should have. Furthermore, this could help reduce the sometimes disproportionate pressure placed on young people by their parents, who may feel unable or unwilling to fulfil their families’ aspirations over and above pursuing a job about which they feel passionate. Afia Ahmed is currently studying for a Masters in Education, Policy and Society at King’s College London. Her Twitter handle is @AfiaAhmed_.